The Australian Transport Safety Bureau (ATSB) released its investigation report on a serious incident in which a a Qantas Boeing 747-438 aircraft suffered an uncontained engine failure shortly after departure from San Francisco, CA (SFO). On 30 August 2010 at approximately 23:30 Pacific Daylight Time, a Qantas Boeing 747-438 aircraft, registered VH-OJP, departed San Francisco International Airport on a scheduled passenger service to Sydney, Australia. 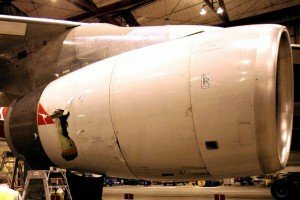 As the aircraft passed through 25,000 ft, the aircraft’s number 4 engine failed, resulting in the puncturing of the engine casing and nacelle and the release of debris. The engine was shut down and the flight crew returned the aircraft to San Francisco International Airport. There were no injuries. An investigation conducted by the engine manufacturer found that the engine failure was initiated by the fatigue fracture of a single stage-2 low pressure (LP) turbine blade. The ensuing rotor imbalance caused the LP turbine bearing to fail, which ultimately resulted in the uncontained release of debris. As a result of this occurrence, the engine manufacturer released non-modification service bulletins NMSB72-AG729 and NMSB72-AG800; instructing operators of RB211-524 engine variants to fit a more robust LP turbine bearing, so as to reduce the likelihood of catastrophic engine failure resulting from rotor imbalance.